The ex-Marine claims numerous UFO sightings occurred near Guantanamo Bay and some of them were even recorded on film by the military. I guess it’s nothing of a surprise that we are hearing reports of the existence of underwater bases around the globe. While some of these ‘secret’ bases are said to belong to different governments, there are other bases that are believed to be in control by extraterrestrial beings, who inhabit Earth. According to statements by a former US marine, while serving in Guantanamo in the late 1960s, he and his colleagues witnessed numerous UFO sightings where anomalous craft came from beneath the ocean. This, according to the former marine would suggest the existence of a huge underwater base in the area. The information provided by the marine, who decided to remain anonymous for now was published by the Mutual UFO Network (MUFON), the world’s largest UFO research organization. The witness describes seeing multiple sightings and remembers that his superiors strictly prohibited him or anyone else to speak about the anomalous activity they had witnessed to the public. ‘All of us Marines were amazed at the amount of UFO activity over and around this base,’ the witness said. When spotting the anomalous crafts, the marine was given instructions to ‘monitor the fence line’ when the UFO’s approached. The former Marine described the UFOs as being up to 100 feet across and were anything but the ‘flying saucers’ we have seen in numerous Hollywood movies. ‘Most of these UFOs were approximately 50 to 100 feet across, but to the naked eye came off as a dull, hazy hull with a small red light trailing behind it,’ he said. While monitoring his post, he witnessed several UFOs flying around the area night after night – ‘landing and taking off out of the ocean’, he explained to investigators. 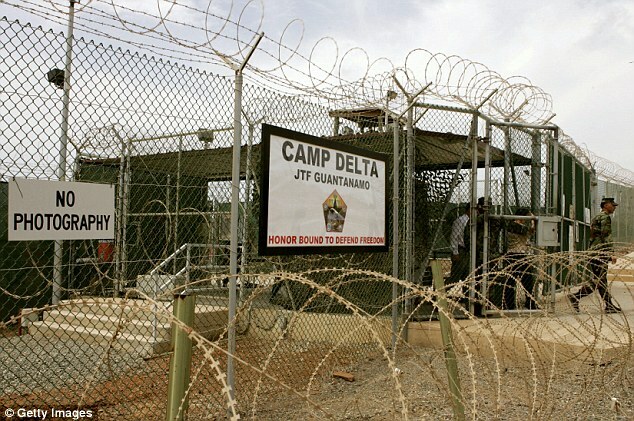 In a report published by Open Minds, the former marine recalls one of the ‘most exciting’ events he witnessed at Guantanamo. Approximately around 7 pm, the former Marine stepped out of the guardhouse, looking over the fence at an empty guardhouse located on the other side of the base and saw a huge shite cloud with what appeared to be blue flashing lights near the surface. ‘It was approximately 7 p.m. (dark) when I stepped out of the guard shack and looked across the fence at the deserted Cuban guard house when something caught my eye,’ the former Marine said. Perplexed by what he saw, the former main asking his comrades what they were seeing as the UFO passed over the shack in their directions. The former Marine remembers seeing the UFO which resembled a huge cloud which blue and white pulsating lights, quietly hovering above them. Soon after someone started yelling ‘Get the Hell out of there’ remembers the former marine. The voice yelling was that of a sergeant at the observation tower who ordered the former marine and his comrades to vacate the area. He recalls that he and his colleagues walked towards a barrack not far from them, observing the UFO sighting from a safe distance. According to reports from the former Marine, a film crew came recorded the ‘alien’ vehicle as it remained static, hovering above them for about three hours before shooting off into space. TOP 100 UFO SIGHTINGS Of 2015 You Will Be Amazed! Just The Beginning!